Simplicity is the key to the success of the Greenwell product. lt is simple to understand, simple to install, simple to remove from one tree and to place around another tree, simple to water – etc etc. IP Information. US Patent Application number 15-599,643 and other International or National IP rights. ln Australia, Greenwell is established and well known as a genuine water saving product. Deep root watering, with minimal water run-off, is assured, when watering plants with a Greenwell that has been installed. 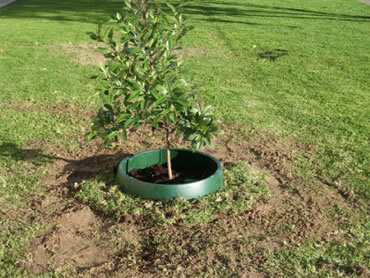 Greenwell is a strong durable product – Municipal Councils in Australia often use the same Greenwell's for multiple street tree plantings over periods of approx. 9 years. The Greenwell's are left around newly planted street trees for approx. 3 years after planting and then reused, when the trees are established, for the next tree planting project and so on. Reuse by Councils for 3 plantings – or even more -is common. The cost per planting episode is therefore quite minimal. Greenwell's are made from recycled plastic-polyprop. One simple way to explain the purpose and function of Greenwell is to examine why Local Councils in Australia use them. Before using Greenwell's most of the water applied by Councils to newly planted street trees, by Council water truck operators, ran off down street gutters. 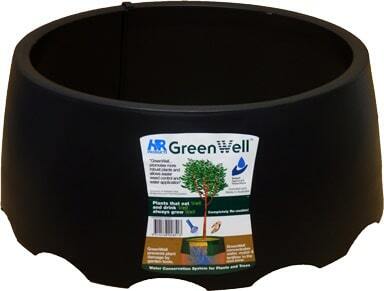 As a result of using Greenwell's all of the water applied – 26 litres regular size and 50 litres large size -is directed deep into the tree roots, with no wastage of water. Water run-off is therefore, all but, eliminated. The water saved is considerable. Greenwell is an all year round sales proposition. ln the colder wetter winter months and in early Spring Councils and Landscapers tend to plant their trees and therefore use Greenwell's. ln late spring through to say May -the dryer warmer months – home gardeners buy Greenwell's to assist their watering activities etc. Greenwell comes in 2 sizes – a regular and a large. Greenwell's zip join – both sizes – allows for easy installation and reuse. lt is easy to place around a tree and to take off from around a tree. The large Greenwell comes in 3 sections that zip together. This makes for improved freight and handling costs. The regular size nests well. Both sizes slope outwards. This is an important part of the Patent, The pressure of the soil on the outward sloping Greenwell – particularly after a few weeks from installation – holds the product firmly in the ground and makes is very difficult for vandals to pull out of the ground. Losses by vandals are minimal where Greenwell's are used in public places for street trees and in parks etc. Apart from directing water deep into plant roots -Greenwell's guard against the scatter of mulch and fertiliser, keep grass or lawn away from plant trunks and also are an effective barrier against damage from whipper snippers. I think? they are called -is it? Line trimmers -in some other Countries. Greenwell's can be positioned in the soil at whatever level is required. lf you require information re. retail outlets that stock Greenwell's, or details concerning pricing etc, kindly ring the Greenwell inventor – Brian mobile phone 0412 693 428 or email him – [email protected] Brian will be pleased to hear from you and to provide assistance as required. Greenwell's come in 3 colours -Heritage Green – Black and Terracotta – both sizes. ln Adelaide, the capital of South Australia, there are approx. 17 Councils in the city and suburbs – 15 of the Councils use Greenwell's as part of their watering operations. Councils across Australia use Greenwell's extensively. Australian Yellow Pages Business ldeas Grants (1997). SAVEWATER Awards – an initiative of the SaveWater Alliance in Australia – in the Product Innovation Section (2010). ls a Smart Approved Water Mark Product in Australia. and has won an MGA Green Thumb Award in the USA (2002). Please do not hesitate to contact me at any time. Under the direction of Dr. Ing. Lothar Wessolly, the well-known expert in tree static and safety.